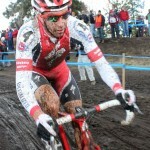 BEND, ORE. – Todd Wells (Cal Giant-Specialized) shut the door on the hopes of Cannondale-Cyclocrossworld.com, Kona and about 130 other Elite racers as he took the 2010 National Championship title in solo fashion. As the Elite men charged off the line to a thick crowd of fans, Ryan Trebon (Kona) powered in the lead, taking the hole shot with Adam Myerson (Cycle-Smart) and Jeremy Powers (Cannondale-Cyclocrossworld.com) on his wheel. 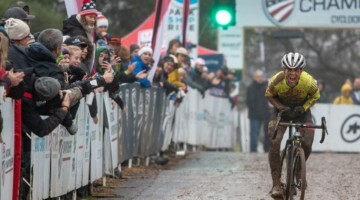 As Powers slipped by, Trebon eased up slightly, as he told Cyclocross Magazine that he had a tough time getting his legs going in the first lap. Tim Johnson and Chris Jones rounded out the top five early. Coming around the front side, Chris Jones (Rapha-Focus) took the lead with Powers and Johnson following close behind, and Trebon and Wicks forming a formidable wall. The five had a good-sized gap between them and Todd Wells as they came into the bowl, now with Powers cranking on the sharp end. It looked like the race might be a Cannondale vs. Twin Towers shoot out. Wells, Alex Candelario, Jesse Anthony (Cal Giant-Specialized) and Tyler Wren (Boo Bikes) formed a chase group behind. Then everything changed. Powers attacked hard as they entered the bowl, gapping off the front and quickly gaining seven seconds. On the corner just after the flyover, Trebon crashed. “I hit a course pole that was leaning into the course – it caught my bars and spun me around,” he said. Jones got tangled up with Trebon, and the two had to extricate their bikes before getting rolling again. Wicks and Johnson dug deep to keep Powers in sight, but it was a hard-charging Wells who, over the next lap, bridged up and entered the mix, ultimately passing the three chasers and catching up to Powers. As Wells caught Powers, Jones faded further off the front. Wicks showed that he has found his form in time for Nationals as he stayed strong in the top five, and he and Johnson would trade positions for the rest of the race. 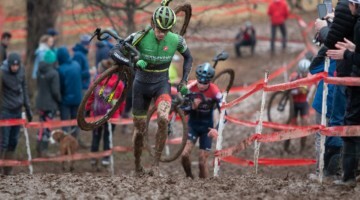 Driscoll (Cannondale-Cyclocrossworld.com) turned on his engine and began clawing his way up the leader board. Trebon, after recovering from his crash, showed why he is one of the best in the country and began an incredible chase, putting in a monster display of power to reconnect with the chasers – but only long enough to blow right by them. Off the front, Powers and Wells went back and forth, trading blow for blow as they screamed around the course a full minute faster than any other group this week. But with four to go, Powers went down on the u-turn right before the flyover; Wells was following so closely that he collided with Powers, and the two tangled for a moment before Wells broke free and rode off, with Powers running behind before stopping to repair a no longer functioning bike. “[Powers] crashed in one of the corners before the flyover, and I ran into him,” said Wells. “My foot got stuck in his wheel, and I’m not sure if that screwed up his wheel or not but it took us a few seconds to get untangled.” Powers was able to fix his bike, but by then he had already been passed by a watt-busting Trebon. 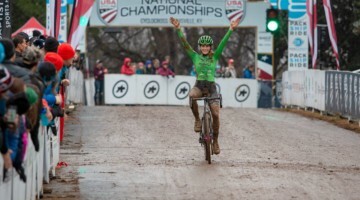 In the end, it was Wells with his hands raised, claiming his third Cyclocross National Elite Championship title. Trebon came in close behind, followed by a train of riders separated by large gaps: Driscoll and Johnson finished the podium, with Wicks just barely missing out. 95 Kip Spaude (27 – Cat2) Watertown, WI @5Lap 213 Nova Cycle Sports Foundation Inc.
DNS Kyle Peppo New York, NY DNS 48 Gs Mengoni U.S.A./G.S. Mengoni U.S.A.
Would JPow's brake problem been an issue if he was using the Zipp 404's, deeper dish rim? Disc brakes? 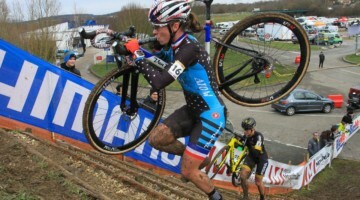 Wells steps on rotor and gets bent, definite DNF?